Wonderful news !! please keep us posted. That's exciting. When's the beta ready? For the "final" version, it'll be a whole new system image (NO SD required) - but for now that's too much hassle for alpha/beta testing. will you provide RobotC for EV3 alpha release to public? I would like to test it. If you're going to want to participate in the initial beta trials, make sure you have a Micro SD card of 4GB or larger since our firmware will initially run on SD card. Also, a class 10 is preferable, unless you like waiting for the image to be written. I hope that Lego and Carnegie Mellon are working together to get ROBOTC 4.0 off and running. I would hate to think that the bottom line is the "the bottom line" and this might be the reason for the holdup. Carnegie Mellon and the Carnegie Mellon Robotics Academy do not develop the ROBOTC application. The Carnegie Mellon Robotics Academy (CMRA) is an educational outreach arm apart of the Carnegie Mellon Robotics Institute that supports robotics-focused educational systems and competitions. CMRA develops and creates the professional development and curriculum around the ROBOTC software. The ROBOTC software itself is developed and owned by Robomatter Inc. (http://www.robomatter.com) and is developed by Robomatter staff and partners around the world. April 2013: ROBOTC development team received EV3 hardware. October 2013: Primary source code from LEGO received - at that time we began initial development of ROBOTC and identified that the code provided to us was not usable for running an alternative Virtual Machine system on "out of the box" from our initial understanding. November 2013: Robomatter (ROBOTC) and National Instruments (LabVIEW) partnered together to create a common modified firmware that would include enhancements to the base LEGO firmware to allow our respective programming environments to be compatible with the EV3. December 2013: Robomatter and NI created a system called "Dyaload" which allows dynamic loading of alternative virtual machines. In additional, NI also created a interfacing layer to the EV3 called "Casper" that would allow our software packages to communicate with the EV3 over the USB/Bluetooth/Wifi connections. Think of Casper as the EV3 equivalent to "Fantom". Documentation regarding the LEGO provided firmware was finally released to us. January 2014: Robomatter and NI had initial code running on the EV3 to interface with the LEGO EV3 Virtual Machine and were able to identify issues with the I2C bus regarding supporting legacy device such as HiTechnic sensors/motor controller/servo controllers/etc that would prevent these devices from working properly. NI and Robomatter began developing fixes to the LEGO firmware system. February 2014: LEGO began development of other/addtional fixes for the EV3 firmware for the I2C issues. NI/Robomatter noticed additional problems and reported/began working around the issues as well. LEGO's fixes did not seem to resolve all of the issues identified. March 2014: ROBOTC Virtual Machine running on the brick successfully - FTC became involved in the development regarding the status of the EV3 for next season and numerous meetings to decide if the EV3 would be compatible with TETRIX and other systems. Ultimate decision was to defer EV3 rollout for a year and treat the 2014-2015 season as a "Pilot" to ensure maximum compatibility. Note: Just getting the I2C problems fixed was not the only issue factoring into this. FTC-based communication system would also have to undergo development before the season began to allow competition to occur. April 2014: Development of hardware interface layer to allow motors/sensors/sounds/LCD/etc to work. Working pretty much non-stop to get something usable for the public by FTC Worlds. I hope this sheds some light on our development and hopefully clarifying any potential financial interest in delaying the EV3 software. Remember that anyone who is purchasing ROBOTC 3.X today (and in the last year or so) will be getting 4.X for free - we're not gaining anything by holding back the release of the EV3 product, if anything, the lengthy development time is delaying us from getting to other projects and features we're interested in. Alright... that's awesome! So getting closer to a public beta? That's more than I was able to get the stock software to do. Will the new robotC for ev3 include the graphical programing enviroment that is available for the robotC VEX platform or is this something that will be far in the future ? It will probably not be included in the initial beta releases, but will come shortly thereafter. Our goal is to bring it to all ROBOTC platforms. Will the upcoming software support Tetrix motors and servos for the ev3? If not, is there a timetable for these to be included? 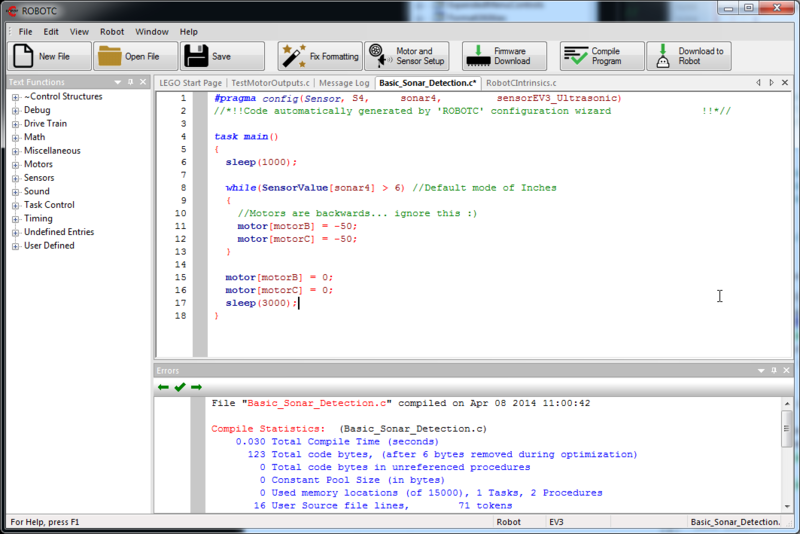 ROBOTC 4.x for EV3 is slated to support those motor controllers, but maybe not straight away. We're working on sorting out some I2C issues in the LEGO kernel modules.